I started putting this gift basket together last night - and finished the arrangement this morning, fiddling with the labelling etc. It was a pleasant, reflective task. I've always enjoyed the process of selecting and presenting gifts. I often prefer to give something I've made myself, where possible - a choice that stems as much from my creativity as any budgetary considerations. 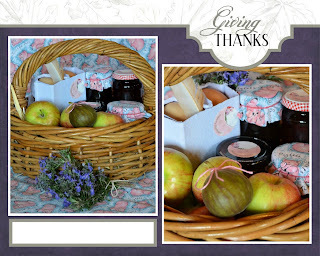 Although there is always pleasure in packaging my gifts, I felt particularly satisfied when I packed this basket as the contents are all our produce, grown at Hamby Home(in)stead or made from ingredients that grew on the property - eggs, apples, a fig, rosemary and four jars of different flavoured chutney. So as much as we are giving the basket to say thanks, we are also very appreciative of living here and having the opportunity to share some of our home-grown bounty.